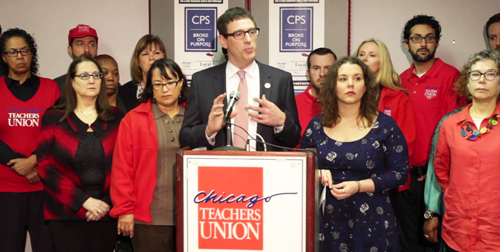 Chicago Teachers Union Vice President Jesse Sharkey announced the results of the CTU strike authorization referendum at a December 2015 press conference.The Chicago Teachers Union will strike on April 1, 2016, if the Chicago Board of Education goes through with the promise, made by its latest "Chief Executive Officer" Forrest Claypool, to take away the pension pickup from union members at the end of March 2016. The pension pickup, which is seven percent of pay, has been part of the CTU compensation package since 1981 and is included in the union's contracts since. The threat by the CPS CEO came after eight months of bluster and bluff by the latest administrative executive team installed by Mayor Rahm Emanuel. Claypool, who had been serving as "Chief of Staff" to Emanuel at City Hall, became the fourth CEO of CPS since Emanuel's inauguration, which took place in May 2011. The others have been Jean Claude Brizard (who was imported from Rochester and ousted after the September 2012 teachers' strike), Barbara Byrd Bennett (who was imported from Detroit and ousted in May 2015 after a federal investigation into her blatant corruption on a nod bid deal with SUPES), Jesse Ruiz (who became "interim CEO" during the choas following the Byrd Bennett revelations) and, most recently, Claypool. Claypool took over in July 2015 and immediately began issuing proclamations based on City Hall talking points claiming CPS was facing a so-called "deficit" ranging up to a "billion dollars." While Claypool was repeating his City Hall talking points for months, he was busy organizing his own expensive executive "team" at the nation's third largest public school system. 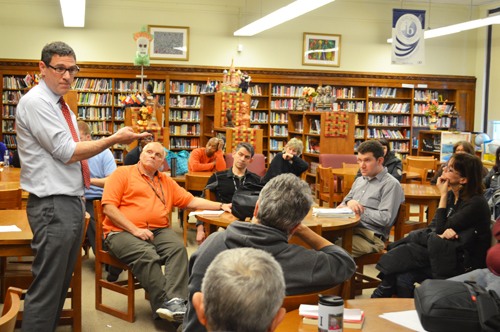 Chicago Teachers Union Vice President Jesse Sharkey (standing, left) met with teachers and other union members at Steinmetz High School on the afternoon of March 1, 2016. Sharkey explained the union's plans for a possible strike if Forrest Claypool goes ahead with his threat to take away the pension pickup within the next few weeks. Substance photo by Sharon Schmidt. Before Christmas 2015, Claypool had discovered that the best qualification to run Chicago's public schools was experience in running buses and subways, at the Chicago Transit Authority. By the end of 2015, Claypool had slowly assembled his new "team" and was slowly ousting the old "team" assembled by Barbara Byrd Bennett. While many of the union's leaders -- including three of the four elected officers -- have been going to schools for meetings, the union is also planning a major meeting with local school leaders. Scheduled for March 12, the annual "delegate training workshop" will focus on the upcoming strike and clarifying how the union's rank and file will be striking. The Contract Summit will bring together school delegates and other school leaders for a full day of training to defend our contractual rights in the schools and organize our power in the school and community. Since the Board has threatened to unilaterally break off good faith negotiations by cutting 7 percent from everyones pay, the CTU is strongly considering a strike over Unfair Labor Practices on April 1, the day that members paychecks would reflect the pay cut. So every school needs to be represented at this summit. Contract Action Teams and all members who want to fight are highly encouraged to attend. We will discuss contract strategy and CTU's plans to stop the Rahm-Rauner-Claypool attacks which include the 7 percent pay cut, layoffs and school cutbacks. We will organize our members, students, our parents and allies to defend quality public schools. Members will also learn about ways to defend our contractual rights in the schools. Saturday, March 12. It looks like the game of brinkmanship is at hand between CPS & CTU. I understand the Boards position that the CTU can't strike until the Illinois Labor Board makes a ruling. However, the CTU doesn't necessarily need to wait for such a ruling to occur. They could easily organize & ask members to take a sick day thereby implementing a sickout as to what's being done with Detroit's educators. A sickout is perfectly legal and within the right of teachers to use their sickdays as they see fit with zero repercussions from the labor board nor the state itself. Atleast this could send the Board a powerful message as to whats to come if they push the nuclear button by implementing a 7% paycut. The Chicago Teachers Union's members -- and finally the members -- began illegally striking in 1968. From the 1969 strike through the 1970s, every strike by the members of the Chicago Teachers Union was "illegal" under Illinois law. When teacher unions finally won collective bargaining rights by law, the idea was that both sides would bargain in good faith in every school district in the state which had a "CBA" (collective bargaining agreement). After the latest CTU leadership was tricked, in many ways, during the first collective bargaining (2011 - 2012), the leaders slowly learned that contracts are won (and enforced) by an organized membership -- not by Ivy League lawyers who receive hundreds of thousands of dollars. CTU in 2016 is returning to its roots, having spent some time in a detour from the rank and file power that supposedly formed the basis of CORE (the leadership caucus, "Caucus Of Rank and file Educators).